Who knew what and when about the health of Fiat Chrysler’s fallen former CEO, tariffs galore, Ford’s troubles and more await you on The Morning Shift for Friday, July 27, 2018. Last weekend, the news that now-deceased Fiat Chrysler CEO Sergio Marchionne was ill enough for the company’s board to replace him in an emergency Saturday meeting came as a total shock to the automotive world. Very few people seemed to know Marchionne was even sick, and by the time he was replaced as CEO by Mike Manley, his exact condition was still unclear. He died Wednesday at 66 and his exact cause of death has not been released, save for the fact that he had had surgery on his shoulder in Switzerland a month ago and that his recovery had gone poorly. The Italian media has reported he had cancer, but people close to him have denied this. For most people, the world would understand that Marchionne was a notoriously private person, accept the unfortunate news and move on. But he wasn’t just some guy—he was the CEO of the world’s seventh largest automaker, and now that company and its board face questions as to what they knew about his health problems and when. 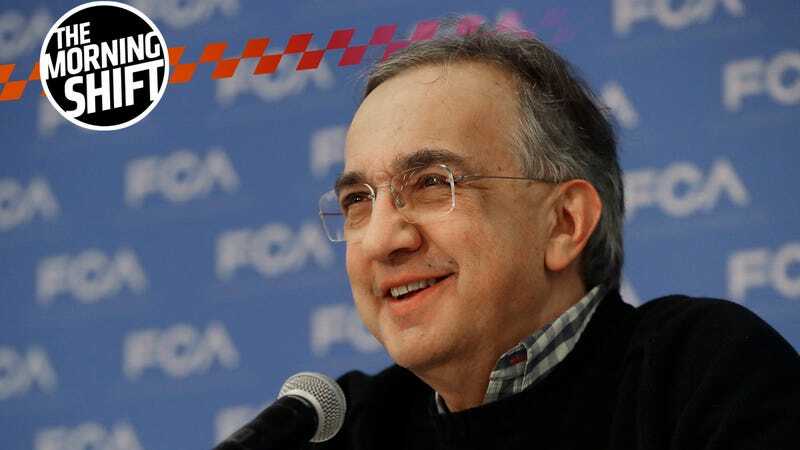 Marchionne reportedly did not disclose anything and FCA says it wasn’t aware, reports Bloomberg. It’s possible FCA investors or even regulators could raise hell over the disclosure (or in this case, lack thereof) of the CEO’s health issues, but that has not happened yet. It’s also hard to parse what good might come from that if they did. At the White House this week President Donald Trump had a big old press conference with European Commission President Jean-Claude Juncker, one where he didn’t promise not to impose 25 percent tariffs on European cars, just to not do it right now and “work toward” a resolution. Remember, everyone is against said tariffs, including the entire auto industry and suppliers, members of his own party, his own desperate advisors, the Europeans, and consumer advocacy groups. But hey! He needs something to tweet about besides Russia and NFL players kneeling, I guess, so don’t expect a true resolution anytime soon. European carmakers climbed after President Donald Trump backed off his threat to levy tariffs on cars imported to the U.S. during a meeting with European Commission President Jean-Claude Juncker, averting for the time being an escalating trade war. The two met Wednesday at the White House with Trump warning that he would move forward with 25 percent tariffs on auto imports if the meeting with Juncker didn’t go well, prompting the EU to respond that such a move would bring significant retaliatory measures on U.S. goods. The breakthrough came after about three hours of talks, leading to their impromptu announcement in the Rose Garden. “We had a big day, very big,” Trump said during a press conference with Juncker. “We are starting the negotiation right now, but we know where it is going.” Trump hailed “a new phase” of trade relations. German Economy Minister Peter Altmaier hailed the deal as a breakthrough, saying the measures agreed by Trump and Juncker could help avoid a trade war and save millions of jobs. Eric Schweitzer, president of the German Chambers of Industry and Commerce (DIHK), said it was up to the United States now to rebuild a basis of trust with Europe, and remove the tariffs. “The proposed solutions move in the right direction, but a significant portion of scepticism remains,” he said in a statement issued shortly after the two men spoke to reporters. 4th Gear: Mitsubishi Is Doing... Good? Yes, here in America we’re skeptical about Mitsubishi’s planned comeback, and how sport coupe nameplates we grew up with now adorn boring crossovers. But those boring crossovers are making money, and some theorists say that’s the entire point of running a business. Mitsubishi Motors Corp. reported a 36 percent jump in operating profit in the latest quarter as the automaker’s rebound gathered speed on rising sales in every key market. Revenue climbed 27 percent to 560 billion yen ($5.06 billion) in the three months, while worldwide retail sales grew 21 percent to 292,000 vehicles. The robust results were buoyed by new vehicles such as the Eclipse Cross and Outlander PHEV crossovers in the United States and the Xpander MPV in Southeast Asia. The upswing underscored the V-shaped recovery CEO Osamu Masuko has pursued in the wake of a 2016 fuel economy scandal and Mitsubishi’s ensuing tie-up with former rival Nissan. Meanwhile in America, things didn’t go great for Ford’s stock price on Thursday. In general this was a very rough week for all of the American automakers: FCA had to contend with the passing of Marchionne as well as a Q2 profit decline and a reduced outlook for the year, GM slashed its own hopes over the steel and aluminum tariffs driving up costs, and Ford took a hit over the same tariffs and sagging sales in China. Shares of the second-largest U.S. automaker dropped 6 percent Thursday to close at $9.89, after Ford slashed its profit forecast for the year and warnedit could spend as long as five years and take as much as $11 billion in charges to fix itself. Neutral: Will The American Automakers Rebound? Tariffs of all kinds are compounding the problems the Big Three have right now, as the Europeans seem to breathe a temporary sigh of relief. What next?